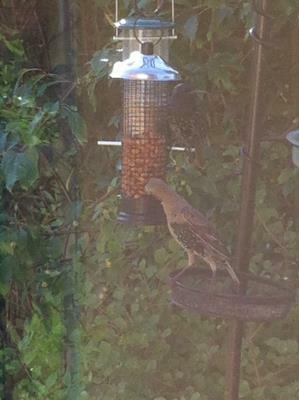 1 Apologies for the poor quality of the photos, but can anyone identify this bird? I'm a complete novice, and I'd never seen it before it appeared in my garden (north east England) this morning. 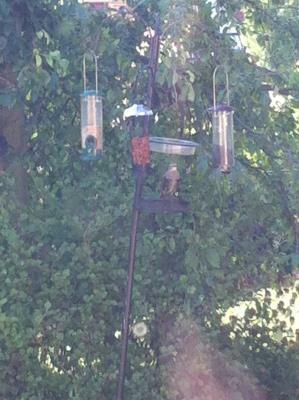 It's about the same size as the spotted woodpecker that visits every day and was definitely interested in the peanuts on offer. 7 Looks like a Turtle Dove. Seeds make up 99 percent of a Turtle Dove’s diet, including cultivated grains and even peanuts, as well as wild grasses, weeds, herbs, and occasionally berries. They also sometimes eat snails.